Cy’s musical life covered several permutations of recording technology, spanning as it did from the mid-1930s through the late 1960s. The advent of his career had 10-inch 78rpm shellac or vinyl discs as the predominant commercial recording media, permitting a three-minute song on each record side; this, in 1950, metamorphosed into the 10-inch 33 1/3rpm “long-playing” record, which, due to the slower turntable speed, could accommodate several songs on a side; and not long thereafter, this 10-inch 33 1/3rpm disc became a 12-inch record, or what we commonly refer to as an “LP” today. And largely throughout Cy’s career, for radio broadcasting recording purposes, 16-inch (or smaller) transcription discs were also used. (These records were not commercially distributed and were produced in unique copies or limited numbers for over-the-air or reference use.) Later in Cy’s career, reel-to-reel tape became a viable recording media, largely for home and professional use but also with commercial sets released. After Cy’s death in 1968, cassette tapes, eight-track tapes, compact discs, and digital audio file media (WAV files, MP3 files, and the like) arrived as modalities for sharing recorded musical performances. In light of this diversity of recording media and the timeline relevant to the creation of Cy’s original recordings (as opposed to their subsequent re-creation in secondary releases), a conceptual dichotomy is helpful. It is best to distinguish between Cy’s original source recordings, in which a particular live or studio performance was first captured on recording media, and those which may be considered secondary source recordings, where that first recording session has been replicated on new, and possibly different, recording media. Thus, topically organized below will be found scans of the musical recording media on which Cy’s performances appear, broken down into these two categories. 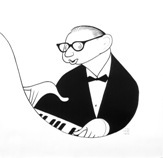 Further distinctions are drawn between commercial and non-commercial recordings; those recordings in which Cy played as solo pianist; those on which he performed with one or more pianist in multiple-piano arrangements; and those on which he performed as accompanist. Finally, although by definition these are all secondary source recordings, we separately list here the commercially-released compact discs offering Cy’s performances, from whatever original source they may have been derived.